Celebrate the Chinese New Year and the Year of the Sheep, with a festive Asian inspired dinner party. No Chinese New Year would be complete without wishes of good fortune and of course good food. 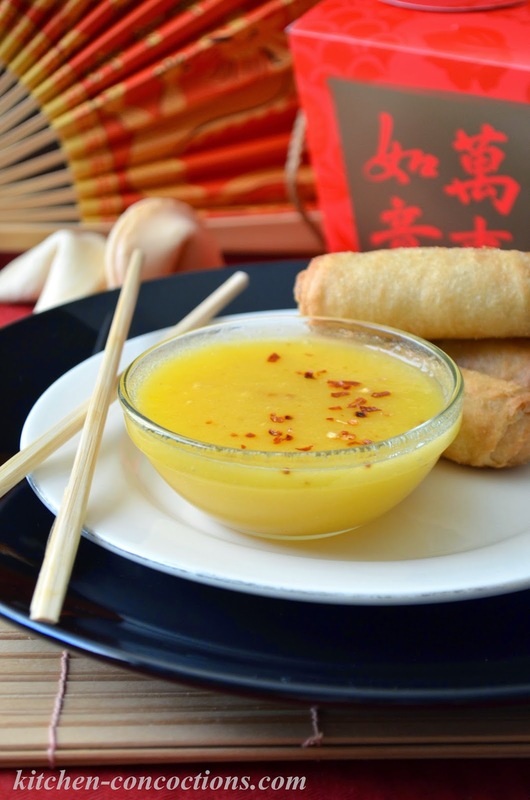 These three custom dipping sauce recipes are perfect for dipping everything from chicken bites to classic Egg Rolls and Spring Rolls. If you have read this blog for any length of time, then you know I love celebrations! I love celebrating everything from a friend’s new job to a family member’s birthday to every single holiday in between! And being a blogger, many of these celebrations, whether large or small, have been shared on this blog!You all have read the stories, seen the décor and enjoyed a variety of recipes. One holiday that we look forward to celebrating every year is the Chinese New Year. I love this fun and festive holiday and the opportunity to have another start at a new year! 🙂 Over the years we have celebrated with dinner out at a local Chinese restaurant or enjoyed restaurant inspired favorites at home, with many of these recipes being shared here on Kitchen Concoctions. This year I am even more excited to celebrate the Chinese New Year with a small dinner party for some close friends and family. Hosting dinner parties are nothing new for me, in fact, I have shared several different parties and themes over the years, but this party will definitely be memorable! This is because we are moving into a new house and it will be our first gathering in our new home! I don’t think I could ask for a better holiday to be the first to celebrate in our new home. The Chinese New Year celebrates the wish of “good fortune” to all in the year ahead, which is the perfect theme for this new chapter in our lives! Since we are literally in the process of moving right now as you read this, I know that I will need to keep our Chinese New Year dinner party simple. For the décor, I will stick with a classic red, black and gold theme. 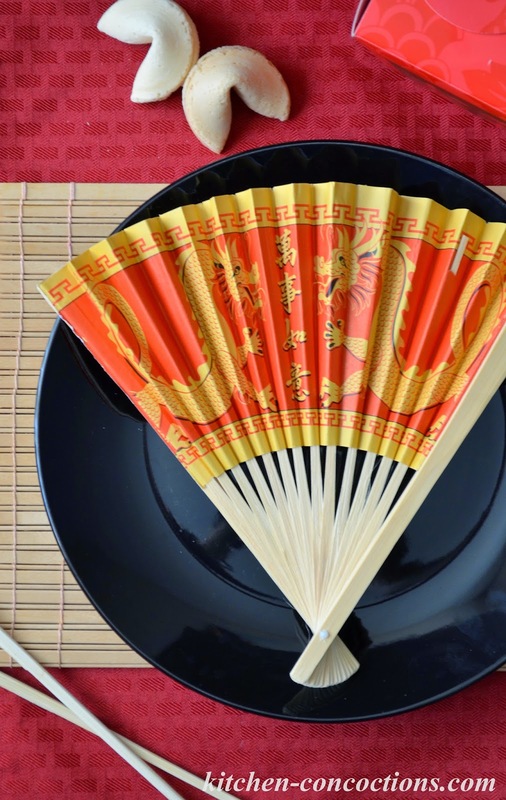 I will use red and bamboo place mats, black and white plates and bowls, and add a few simple decorations like chopsticks, fortune cookies, Chinese take out boxes and paper fans. For our menu, I will serve a platter of spring rolls and egg rolls with a trio of dipping sauces and a simple Chicken and Bell Pepper Stir Fry over coconut rice for our main entree. For dessert? Chocolate dipped fortune cookies of course! 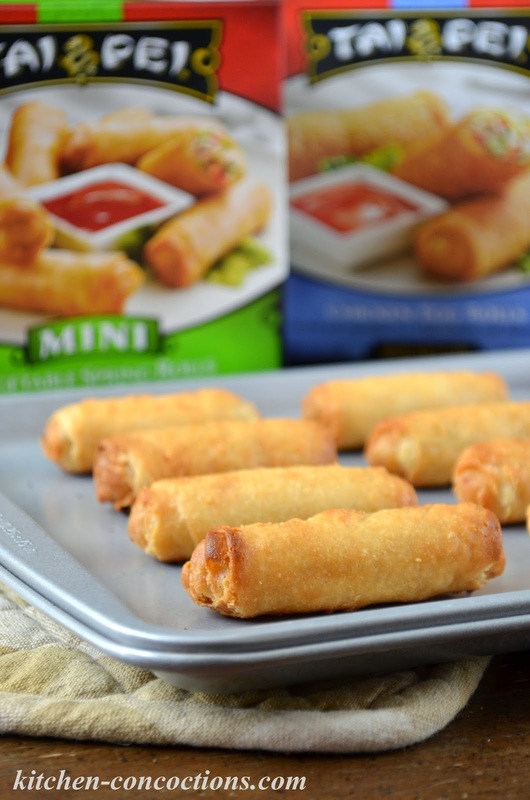 To help make this dinner as stress free as possible, I’ll pick up some Tai Pei® Egg Rolls and Spring Rolls from my local Walmart. These authentic Asian appetizers are convenient, as they cook up in minutes, and come in a variety of flavors, like veggie, chicken and pork. Even though these appetizers do come with a convenient dipping sauce, I decided that for my party I want serve a trio of custom dipping sauces. Not only will this add variety, it will be a nice, edible “center piece” for our dinner party. Recently as I practiced for our party (yes, I do practice all the recipes for my dinner parties and set up “mock tablescapes,” because, well, it is fun! ), I decided I wanted to take some classic Asian flavors and dipping sauces and put a new twist on them. Below are the recipes I came up with. 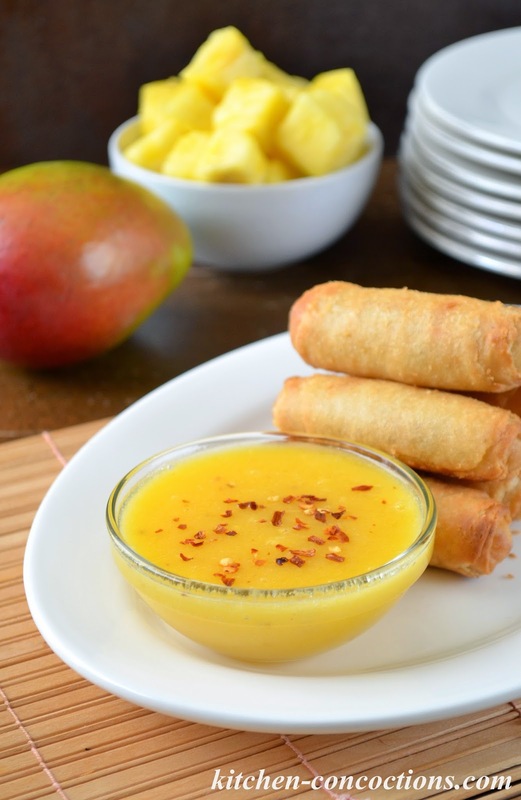 The Sweet and Spicy Pineapple Mango Dipping Sauce is my personal favorite because I love a good sweet and spicy sauce. 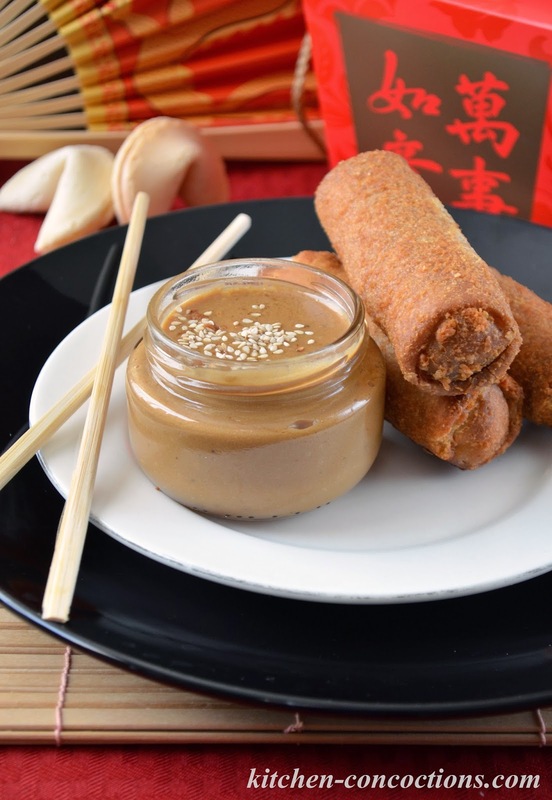 The Cashew Butter Dipping Sauce swaps out traditional peanut butter for nutty cashew butter and the Creamy Cilantro Lime Dipping Sauce is a cool and creamy sauce, which paired perfectly with the crispy Tai Pei® Chicken Egg Rolls! What would you serve at your Chinese New Year Celebration? This sweet and spicy dipping sauce with a tropical flare is perfect for dipping everything from chicken tenders to spring rolls! Combine all ingredients in a large food processor. Process on high speed for 30-45 seconds. Using a rubber spatula, scrape down the sides. Process for an additional 30-45 seconds or until sauce is smooth and creamy. Taste and adjust seasonings to taste. 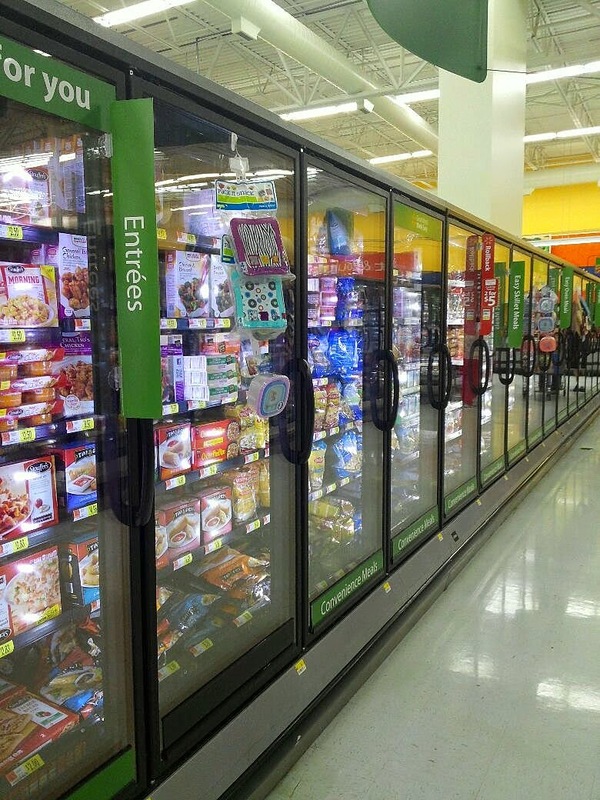 Dipping sauce can be stored in an air tight container in the refrigerator for up to one week. A new twist on the classic Asian inspired peanut sauce, this cashew version is perfect for dipping and dressing salads! Dipping sauce can be stored in an air tight container in the refrigerator for up to one week. 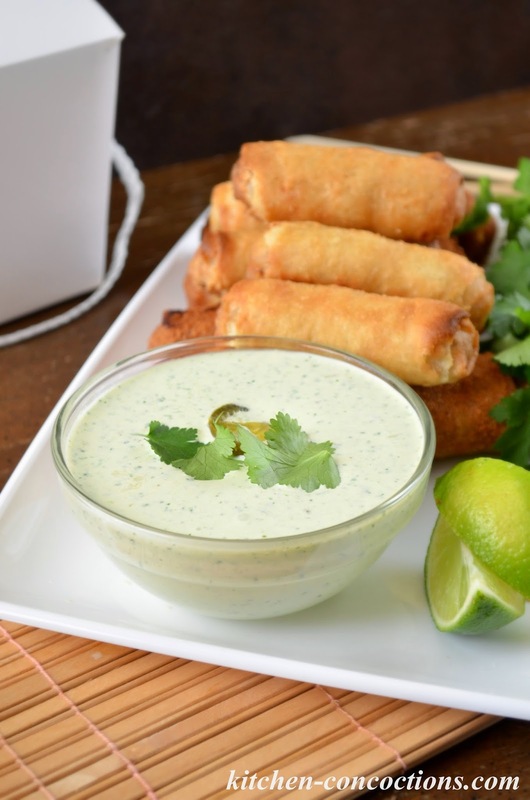 A creamy dipping sauce with fresh cilantro and lime. I am excited to welcome the Year of the Sheep and look forward to lots of good fortune in our new home! I also wish a year of good fortune to all my friends, family and to all you dear readers! For more Chinese New Year ideas, visit Tai Pei® on Facebook, Twitter and Pinterest and check out their Chinese New Year app on the Tai Pei® Facebook page (under the Red Envelope tab) for valuable product coupons (available for a limited time).